You can easily select one or more HTTP information lines, and then export them to text/html/xml/csv file or copy them to the clipboard and then paste them into Excel. This utility works on any version of Windows, starting from Windows 2000 and up to Windows 10, including 64-bit systems. WinPcap Capture Driver: WinPcap is an open source capture driver that allows you to capture network packets on any version of Windows. You can download and install the WinPcap driver from this Web page. Option 2 (XP Only) : Download and install the Windows XP Service Pack 2 Support Tools. One of the tools in this package is netcap.exe. When you run this tool in the first time, the Network Monitor Driver will automatically be installed on your system. Microsoft Network Monitor Driver version 3.x: Microsoft provides a new version of Microsoft Network Monitor driver (3.x) that is also supported under Windows 7/Vista/2008. The new version of Microsoft Network Monitor (3.x) is available to download from Microsoft Web site. It doesn't work in all Windows systems, depending on Windows version, service pack, and the updates installed on your system. On Windows 7 with UAC turned on, 'Raw Sockets' method only works when you run HTTPNetworkSniffer with 'Run As Administrator'. After running HTTPNetworkSniffer in the first time, the 'Capture Options' window appears on the screen, and you're requested to choose the capture method and the desired network adapter. In the next time that you use HTTPNetworkSniffer, it'll automatically start capturing packets with the capture method and the network adapter that you previously selected. You can always change the 'Capture Options' again by pressing F9. After choosing the capture method and network adapter, HTTPNetworkSniffer captures and displays every HTTP request/response sent between your Web browser and the remote Web server. 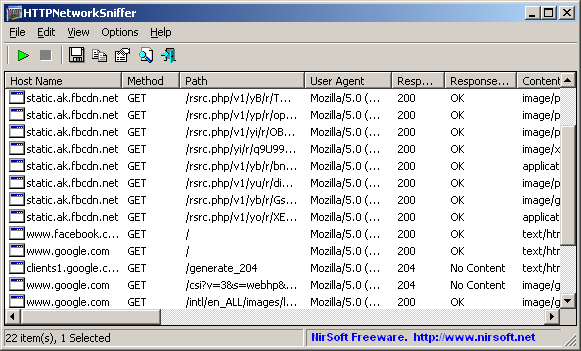 /load_file_pcap <Filename> Loads the specified capture file, created by WinPcap driver. /load_file_netmon <Filename> Loads the specified capture file, created by Network Monitor driver 3.x.